This is a simplified version of bisibelabath. Hang on, I didn’t mean the authentic one, it’s my version. When you feel lazy to cook, this would be an easier recipe with a quick cook time. 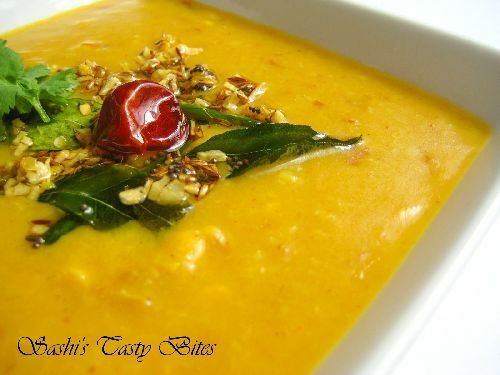 Of course, dhal with ghee tastes heavenly and you can add any vegetables of your taste. Though it is sort of an instance recipe, it vanishes from the plate pretty fast. 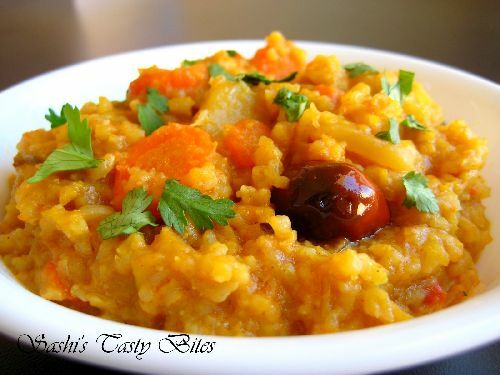 Soak Rice and dhal together for 30 min and wash it thoroughly. Chop tomato, onion into small pieces. Finely chop ginger and garlic. In a pressure cooker heat oil, when hot, add asefoetida, ginger and garlic. Fry for 30 seconds. Add onion. Saute well till it turns golden brown. Add red chili, tomato and cook till they become gravy. Add the vegetables and cook for 2 min. Add Sambar powder, turmeric and salt. Allow it to boil. When it starts bubbling add the soaked rice and dhal. Add 4 cups of water and mix well. Check for the salt and close the lid. Allow it to cook for 3 whistles. When the pressure is released, add ghee and mix well. Adding more water makes the rice get mashed up and tastes good. Adding ghee is optional, but it enhances the taste. 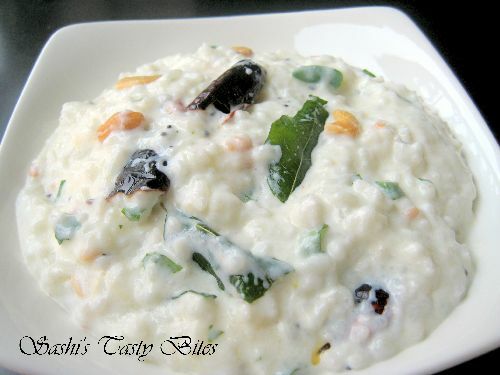 This is similar to Arisi Paruppu Sadam with Vegetables. 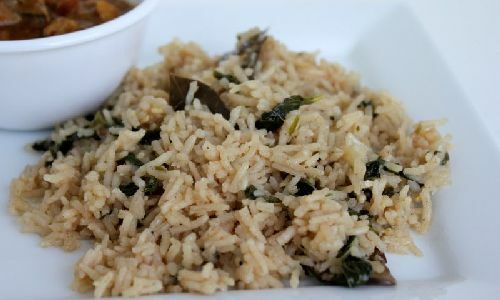 If the rice is not mashed up, add 1 cup of hot water and mix it well. (*) Recipe from my Mom’s Kitchen. 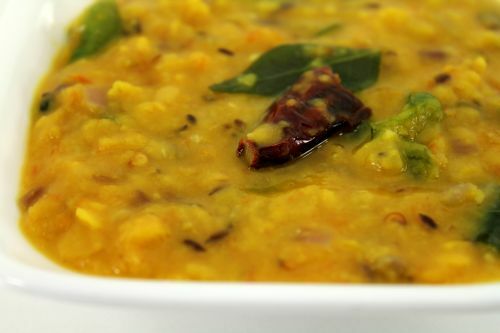 Vidhya, I have some sambar recipes.. try them – http://www.sashirecipes.com/ingredient/toor-dhal-yellow-lentil-toovaram-paruppu. I will post some more recipes soon. thank you very much sashi!!! could you please tel me the tricks of hotel sambar smell and taste? I’ve tried this yesterday and turn out very well. Thanks for the recipe. Which sambar powder do u use sashi?? 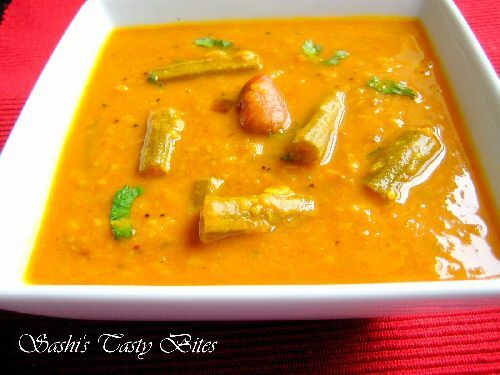 Sandhya, I usually mix Sakthi masala sambar podi + homemade one. Sashi , your recipes are spot on. Simply love it. They are almost like my moms and thats just another reason to love it !! Have tried 4 – 5 of your receipes so far and all of them turned out fantastic !! please continue the good work ..
this recipe is really yum….thank u so much !!! Awesome !! Thanks Saranya for coming back and letting me know. Luved ur version…heavenly combo as u said! Slurp! Droolz! I can’t keep resisting! If the plate’s in my hands, not a morsel will be left! Slurpppp! !wat a comforting food…feel like grabbing the whole plate and finishing rite now..
looks delicious and so beautiful click sashi..